Ruth writes: When I first started this blog almost four years ago, I had a dream. It was to encourage Torontonians to visit each others’ festivals. I was hoping we could make friends in other cultural communities this way. Alas, it didn’t quite happen that way. Outsiders at that time told me they were nervous about going to the festivals and religious buildings of other groups. They didn’t know what to expect or how to behave. Would they be welcomed? What did they have in common with strangers? Consequently, I wrote about my own experiences in this blog, my adventures as an obvious visitor to mosques, Ethiopian Orthodox churches and Zoroastrian temples. I mentioned the places where I had to take a scarf to cover my head, or to take off my shoes. In most of these places, members at least smiled at me, and answered my questions about their religion and their food. There were a few exceptions – places where I felt I was completely invisible. On my first trip to the Vishnu Mandir in Richmond Hill, alone and unannounced in a Hindu temple, I was welcomed by no one. A woman at a desk growled “Take off your shoes”, “Did you bring gifts?” and “Don’t take pictures.” I found one friendly worshiper willing to answer my questions. I learned that asking questions helped break the ice and there were so many questions to ask. The following year, I organized a second visit to this temple with friends, this time making an appointment with a priest to meet us and tell us about Hinduism. He was very welcoming and apologized for the lack of recognition to strangers. He said. “Our people are not prepared to reach out to others. We’re working on this,” he assured us. Last year I went to this temple alone again during the coloured-powder throwing festival of Holi. I was hoping to find a place in Toronto where this fun festival was actually practiced the way it was in India. Again people treated me as if I were invisible until one nice lady asked if she could put paint on my face. After that, people smiled at me. The change was amazing. Copyright ©2015 Ruth Lor Malloy. This year, my friend Romaine went with me on my fourth trip to the Vishnu Mandir again unannounced. 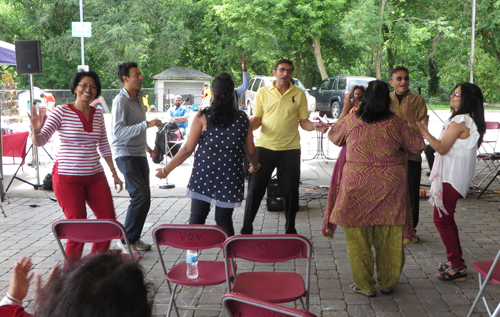 The occasion was “Summerfest and Open House at the Peace Park — A Treat for a Joyous Canada Day Celebration”. Over the years, I had gone to Canada Day celebrations at other venues around the city – but never to a temple. I couldn’t resist a new angle. From the moment we arrived outside its main door, the atmosphere was friendly. 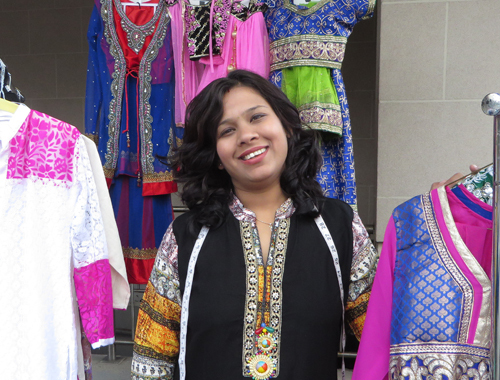 Women selling jewellery and clothes beckoned us to see their wares. Others encouraged us by opening steaming chafing dishes and sending fragrant curry smells in our direction. Okay, they were trying to sell us something but they were smiling and acknowledging us. 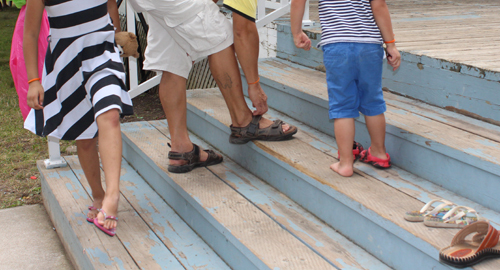 As we left our shoes in a cloak room inside, an Indian woman mentioned visiting the museum. 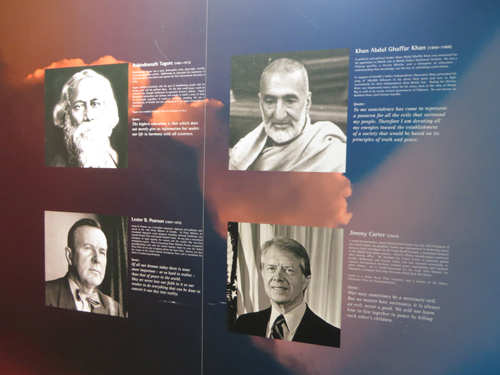 Rabindranath Tagore, Abdul Ghaffar Khan, Lester B. Pearson, Jimmy Carter. We took the museum tour. Young volunteer guides gave explanations and cheerfully answered questions. I never had an opportunity to see this museum so completely before. One hall was full of images of many world leaders like Nelson Mandela, the Dalai Lama, Lester Pearson, Martin Luther King Jr., Jimmy Carter, and the Buddha. There was a Star of David, and the crescent moon and star of Islam. Much prominence was given to Mahavira, the founder of Jainism. The bust of Myanmar politician, Nobel Peace Prize winner Aung San Suu Kyi, was lined up there too, but the guide tended to ignore her. I wondered if this was because of her lack of support for the oppressed Rohingya Muslim minority in her country, but I never got around to asking. 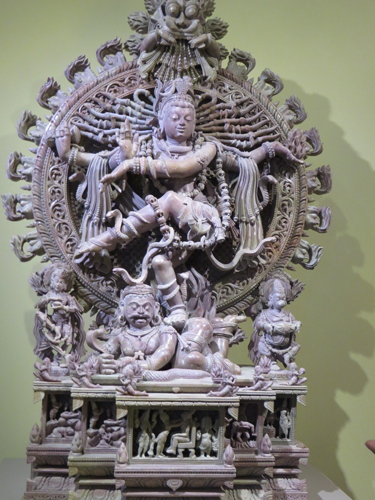 In the museum were a beautiful Dancing Shiva and exquisite shrines. 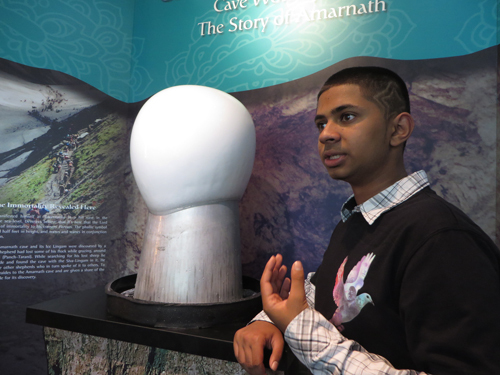 The guide encouraged us to touch the frozen Shiva Linga, a replica of the one in the Jammu and Kashmir Amarnath Cave, an important Hindu pilgrimage site. It was indeed cold and frozen. When I went home, I looked it up on the Web. It was a fascinating natural phenomena. 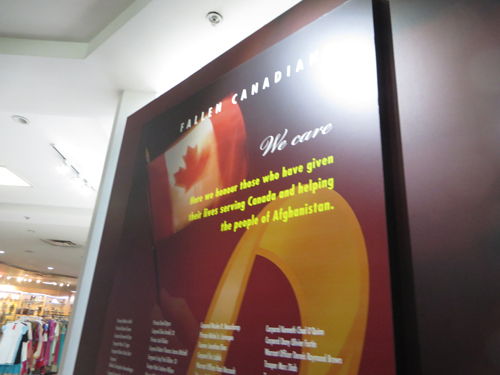 A list of Canadian military killed in Afghanistan was prominent. Such was not the kind of memorial I expected to see in an Indian temple and I felt moved that they cared. 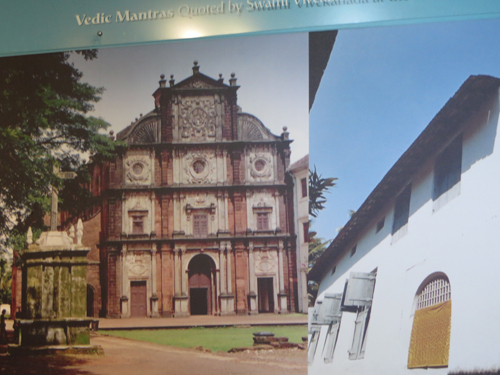 Pictures of a mosque, a synagogue and a church – all in India – could not be missed. Church in Goa. Jewish synagogue in Cochin, India. Symbols of different faiths leading to the same end. Later as we were wandering by ourselves around the main hall room with its impressive statues, I saw some shrines I hadn’t noticed on previous visits. A friendly man overhearing our conversation volunteered that today was Full-moon Day, the day the child Lord Krishna returned to tease the gopi, the milk maids – a favourite story. Krishna is always depicted as blue. Kamlesh Shah also explained that Indians felt uneasy with strangers, not knowing what strangers wanted. I remembered my own years in north India and the store clerks who never smiled. My own theory about this was the frequent invasions of north India by outsiders. One learned not to trust strangers. Mr. Shah, who was from South India, said that South Indians were friendlier. I felt that we made a new friend when he told us about his own family. Then a group of dancers invited us to join them. But it was not just the friendly atmosphere that we liked. Romaine and I went alone to inspect the Peace Park bordering on Yonge Street at the front of the temple. 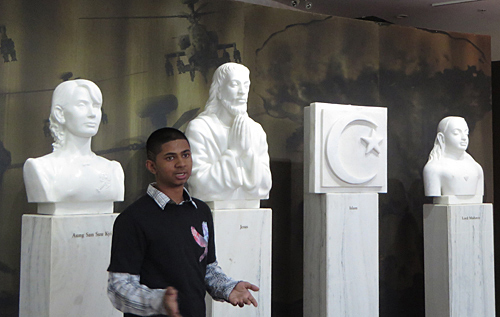 It was tranquil and full of thought-provoking quotes from the likes of Martin Luther King Jr. and Nelson Mandela. 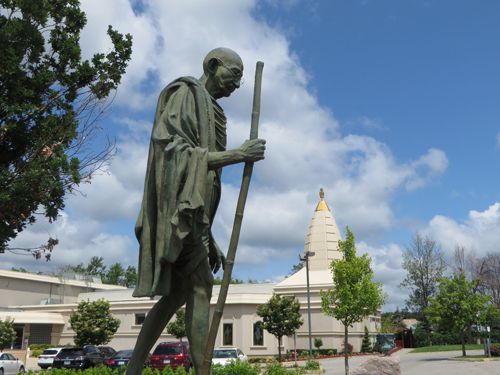 The statue of Mahatma Gandhi there was unveiled in 1988. I never noticed it before, never realized that Toronto had a statue of the saintly leader who managed to rid his country of British imperialists non-violently. Quotes set in stone were from non-violent advocates. “The day the power of love overrules the love of power, the world will know peace,” said the Mahatma. A stone monument there was dedicated to Canada’s Peacekeepers. The theme was world peace and I found it encouraging that this temple was reaching out beyond the Indian community for its inspiration. Unfortunately, I didn’t notice many other non-Indian visitors that day at the event. People taking the tour were mainly Indians. 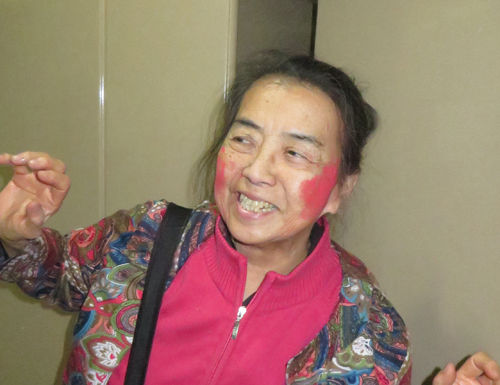 But I felt very happy because of the welcome. It was indeed a lovely way to spend Canada Day. This was one of Toronto’s many multicultural opportunities. If you go to others, please share your experiences. Write to us at: ruthlormalloy@gmail.com. Thanks for the feedback on your visits to Vishnu Mandir. The Evolution of the Vishnu Mandir continues and the strong backbone of ladies in The Laxmi Sabha group makes a conscious effort to ensure that our visitors are warmly welcomed, treated with utmost respect, and hospitality. I have learnt that we are all connected, we are all beings of energy – our energies are connected. Everything is God-Ishvara and the Lord is everything. Totality of everything is God. Namaste, Ruthji. 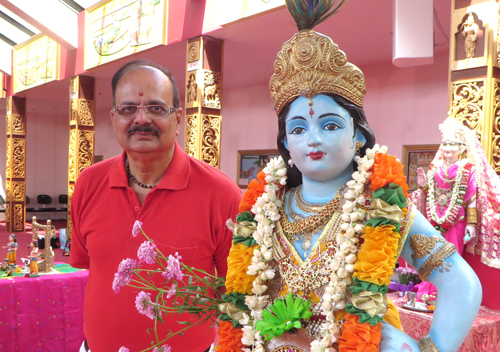 I am happy your visit to Vishnu Mandir on Canada Day was a pleasant and rewarding experience. You will recall that when you discussed with me (lady in red dancing)of unpleasant experiences in past visits, my response was you didn’t meet me then. It was a pleasure to be of service to you and your guest. Do visit again. What a beautiful article, Ruth. You are my hero. I agree with you about how insular some Torontonians are. You are doing a great job of creating desire for education through your blog and your calendar. I have attended many cultural events that I would not have heard of without your help. Count me among your many fans. Perhaps at the top!